Weirs, like orifices, are used to model outlet and diversion structures in a drainage system. Weirs are typically located in a manhole, along the side of a channel, or within a storage unit. They are internally represented in InfoSWMM and InfoSWMM SA as a link connecting two nodes, where the weir itself is placed at the upstream node. A flap gate can be included to prevent backflow. The height of the weir crest above the inlet node invert can be controlled dynamically through user-defined Real-Time Control Rules (RTC Rules). This feature can be used to model inflatable dams. 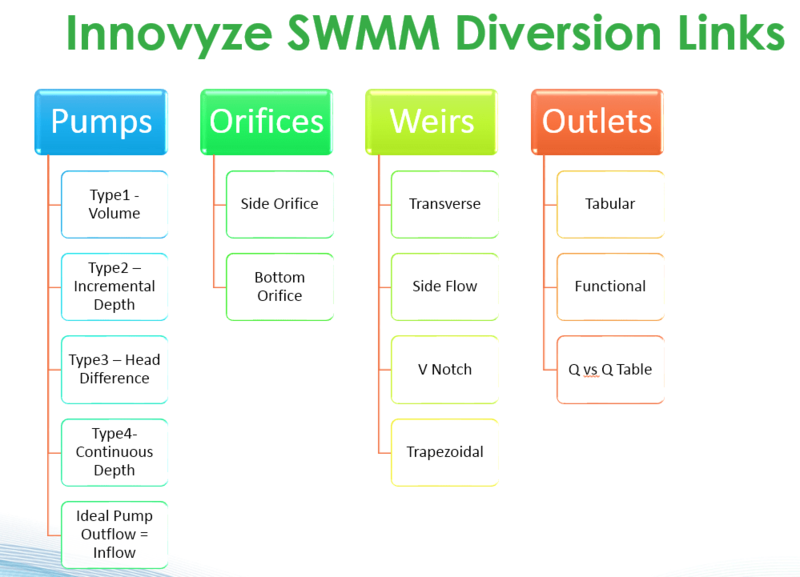 Note: Weirs can be used as storage unit outlets under all types of flow routing. If not attached to a storage unit, they can only be used in drainage networks that are analyzed with Dynamic Wave flow routing.